Placebo are a misunderstood, vile and brilliant trio. Many of the misunderstandings have of course been self-induced. 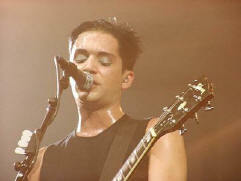 Placebo said arriverderci to seriousness and earnestness when they rode 'Nancy Boy' to the big time. Placebo albums may share a similar affliction: a few great songs, and a lot of fairly boring ones. The spotlight tonight is on the band's latest album, 'Sleeping With Ghosts'. Dressed in black and made up to a pale, pale white, Placebo are surely a strange choice to replace the advertised headliners, Linkin Park. It's a last minute switch, the band being rushed down from the Pink Pop festival in Holland where's they've apparently played earlier today. An announcer comes on to hype up the replacement but it's quite obvious that this crowd was primed for something harder and heavier than what Placebo's packing. Maybe because they're tired, or maybe they're feeling out of place, but Placebo's gig convinces the knowledgeable or undecided fan of nothing and leaves the listener with little of the excitement felt from the band's recorded product. It's a dull set. Though opening with the great ('Bullet Proof Cupid') they delve quickly into the ordinary ('Allergic?To Thoughts Of Mother Earth') before the show disintegrates into the desultory with 'Protect Me From What I Want'. A lift in this patchy, up-and-down show then comes in the form of 'Bitter End'. It's quite apparent that neither Placebo nor their audience are prepared for their meeting, and the band's layered-meaning, androgynous material doesn't go down with an audience here for harder, more blunt rock acts. The group's apparent tiredness doesn't help. Even with a beefed-up tour band (Bill Lloyd and Xavier Roide have both been added on keyboards and bass) Brian Molko's vocals seem restrained or lethargic. 'English Summer Rain', a fine, old-form track off the new 'Sleeping With Ghosts' album raises the spirits as we move into the second half of the show. 'Without You I'm Nothing' isn't bad either. But 'This Picture' and 'Special K' pour cold water over this reviewer's rising hopes and I'm getting sleepy - it's 1am on a balmy north German night. 'Taste In Men' do nothing to wake me up. Thankfully Molko & Co choose a decent trio of songs to finish: 'Slave To The Wage', 'Teenage Angst' and 'Pure Morning' offer some redemption to a frustrated fan. As a band they look great: dressed in black with white-white face make-up and sharply styled hair, they've certainly taken more than a passing influence from their acknowledged hero (and admirer) David Bowie. The stage presence and provocative get-up of Bowie is there but Mr Bowie made his way on more than image and stage antics. He had great songs and delivered them with power. Placebo just didn't deliver well enough tonight.